Watch Olympic Cycling with the Women’s Road Race from noon (free to watch). Bouncy Stonehenge is in Cheam Park, Sutton (free). Support fledgling food market, Harringay Market between 11am-3pm. Latin American festival Latidos brings live bands, dancing, authentic food and more to Shaka Zulu, Camden Town from 3pm-midnight (£8 adv, £10 on door). 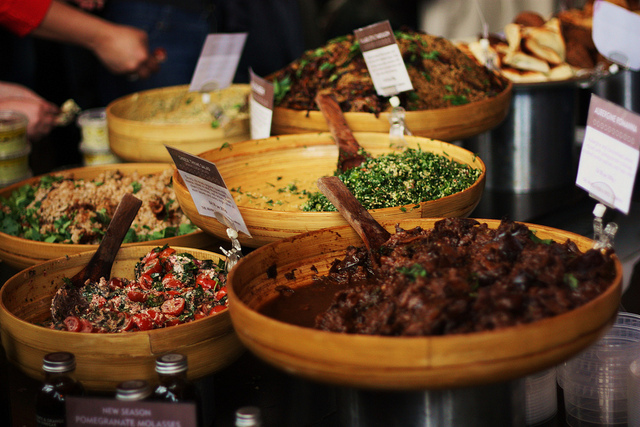 Walk around and taste some delicious food on Borough Market, which will be open on Sundays during the Olympics. Enjoy a winter wonderland and snow fall at Trinity House near Tower Hill and win a skiing holiday to Austria (free). Last chance to watch The Boy Who Fell Into A Book at Soho Theatre (part of London 2012 Festival, £10-15). Any breaking news of disruptions will appear here. 11.50am Cycling, Women's Road Race, The Mall. Brief guide. 11.50 Sailing, Opening Series Races, Weymouth and Portland. Brief guide. 2.55pm Archery, Women's Team Final, Lord's Cricket Ground. Brief guide. 4.50pm Men's Football, Senegal vs Uruguay, Great-Britain vs United Arab Emirates, City of Coventry Stadium. Brief guide. 6.50pm Hockey, Women's Group Matches, Riverbank Arena. Brief guide. 7.25pm Swimming, Men and Women's Finals, Aquatics Centre, Brief guide. Sunshine and rain will alternate through the morning, with heavy showers and wind expected in the afternoon, so make sure you have an umbrella with you. Min. 12, mx. 18 degrees. Image by Stephskimo from the Londonist FlickrPool.